Workspaces are a good way to organize and group information. Access and permissions can be set at the Workspace level. Any Internal Member with permission can create a workspace. Workspace Type: pre-configured workspace types for easier setup. Workspace Name: the name of the workspace is for your identification only. The URL will be the address at which the workspace is accessed (these can be changed at any time). Workspace Options: workspaces can be made to be part of a Workspace Group directly from creation and can be seeded with sample data for tutorial purposes. You can also add members to the workspace directly during creation. 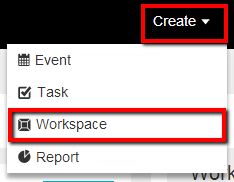 Workspace Properties: fill out the Workspace Properties at creation. Note that these fields can be edited in the Workspace Properties section of Company Setup. When creating a workspace from a workspace designated as a template eliminates much of the setup needed to get started. 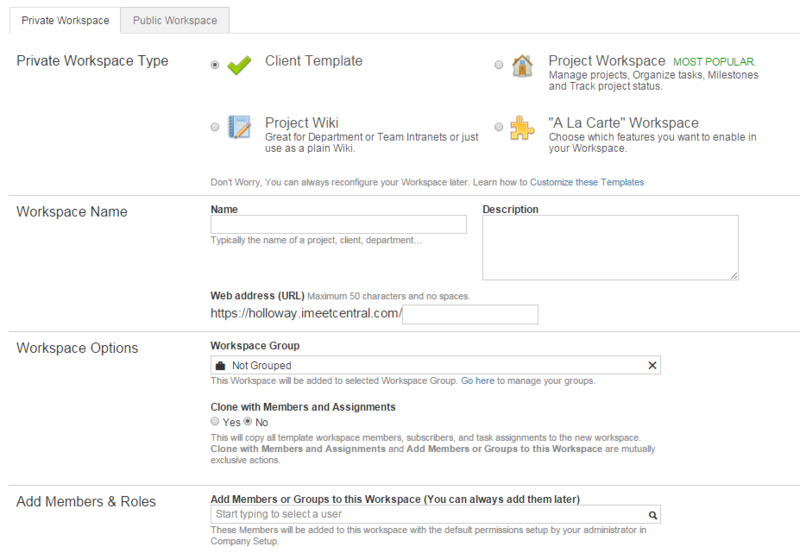 When creating a workspace from a template configured by the organization it is possible to retain the Members and Assignments found in the Template. This option will appear under Workspace Options when a template is designated as the workspace type.